Every Easter, my Catholic Sicilian grandmother made a special bread. It was a bit sweet, braided and had colored eggs in it. This year, I plan to make my own. I feel it honors my ancestors and keeps a tradition alive, albeit modified. Gram’s recipe died with her, but I think the one below will come close. 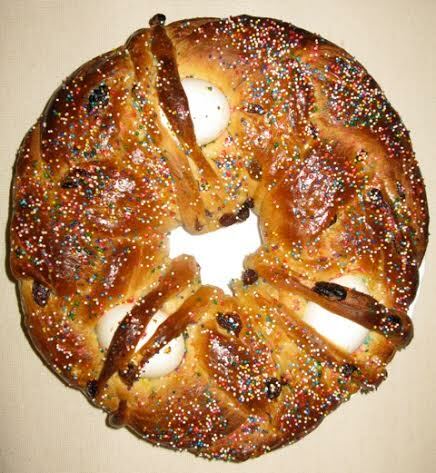 My Germanic ancestors also baked a similar sweet braided wreath decorated with eggs for Easter. Look to your ancestors for a traditional Easter food. In England, that might be hot cross buns; in Poland, it’s babka. I found a wonderful recipe by Marbalet online at allrecipes.com. together. Mix with the flour mixture until stiff dough is formed. (or form into shape of people), and place on greased baking sheets. lightly with powdered sugar while still warm. Place milk mixture back on the heat till warm again; pour into mug and enjoy.